Our residents come from all walks of life. Some have traveled the world, others have built legacies through their careers, and all have created generations of families and friends. Each resident has painted a portrait of their lives and will continue to add brilliant colors to their lifeâ€™s murals while living at Summers Landing at Limestone. We are truly privileged to be a part of their continued stories â€“ and yours â€“ by creating a senior living community where you are respected and honored for who you are. 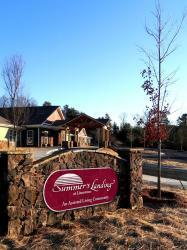 Summers Landing at Limestone community creates a special place for people who want a lifestyle that removes the hassles and adds whatâ€™s truly important. We know itâ€™s a difficult decision to move or leave your home â€“ thatâ€™s why we welcome you to our friendly community. Weâ€™re committed to creating positive, stimulating ways for you or your loved ones to continue living your life with meaning and purpose. And if needs change, we are there to provide the added support and services required without additional expense. We take the time to get to know you or your loved oneâ€“ your story, your life interests, and whatâ€™s important to you. This understanding helps us create the most fulfilling experiences every day. Our residents will be enriched by our blend of the very best in every aspect of life â€“ friendly and professional staff, secure living arrangements and purposeful programs. Our strong sense of community fosters social connections Healthy living classes promote physical fitness Lifetime learning stimulates new interests and intellectual development Our dedication to emotional and spiritual wellness is supported by a variety of ongoing opportunities. At Summers Landing at Limestone, our story is about helping you continue your story and whatâ€™s most meaningful to you in life.